Chronic traumatic pseudoaneurysms of the thoracic aorta are very rare and usually occur in victims of brutal deceleration. The level of the aorta most commonly affected by a deceleration injury is the aortic isthmus. We describe a case of an extremely uncommon cervical rupture of a chronic posttraumatic aneurysm of the aortic isthmus. 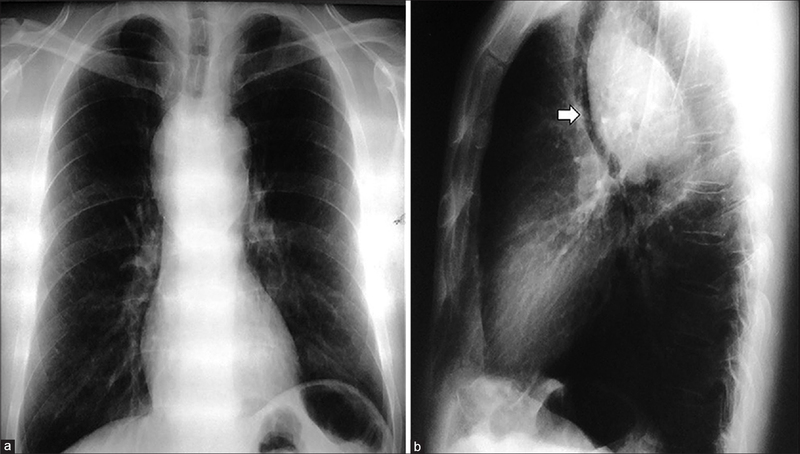 A 48-year-old asymptomatic male patient was referred for workup after an incidental discovery of a widened mediastinum on plain chest X-ray on on routine check-up [Figure 1]a and [Figure 1]b. From the medical history, it was noted that the patient was involved in a road traffic accident 20 years before the current admission. Computed tomography (CT) scan of the thorax with IV contrast demonstrated a bulky, round-shaped aneurysm of the posterior aspect of the proximal descending aorta after the left subclavian artery (isthmus), measuring approximately 8 cm × 6 cm [Figure 2]a. After the scan and while the patient was still in the CT room, he became diaphoretic and complained of a mild retrosternal pain. Moments after that, he collapsed and became unresponsive. His vital signs at the time were blood pressure of 80/60 mmHg and oxygen saturation 93%. After initial assessment, the patient was intubated and resuscitated. On stabilization, the patient underwent a second, urgent CT scan which showed a large hematoma extending to the neck, and compressing the trachea [Figure 2]b and [Figure 2]c.
The patient was immediately transferred for emergency surgery. He underwent a left posterolateral thoracotomy through the fourth intercostal space. The patient was connected to partial cardiopulmonary bypass via left femoro–femoral access. The aortic arch, left subclavian and proximal descending aorta were mobilized and three vascular clamps (one in distal arch, one in left subclavian and one in distal descending aorta) were placed to exclude the aneurysmal portion. Subsequently, a tubular prosthesis (Hemashield Platinum Double Velour Vascular Graft No 20, Maquet, Germany) was sutured [Figure 3]. The patient tolerated the operation well. He made a slow recovery which was complicated by a left femoral thrombotic event and a transient episode of delayed paraplegia. He was discharged on the 20th postoperative day. Posttraumatic injuries of the aortic isthmus and the descending thoracic aorta in general are conditions burdened with high mortality and morbidity risks. The predominant mechanism of injury is the force of deceleration which is concentrated at the junction of fixed and nonfixed segments of the thoracic aorta. Parmley et al. reported that about 2% of patients with traumatic aortic injury survived long enough for a chronic aneurysm to develop and a stunning 86.2% were dead before arriving at the hospital. The same authors reported that the aortic isthmus was the most common site of all traumatic injuries. Free rupture to the pleural space represents the most common devastating complication of an aortic isthmus blunt trauma. However, occasionally, the adventitial layer of the aorta remains intact thus, being able to contain the hematoma leading to the development of a chronic pseudoaneurysm. The blood contained in the pseudoaneurysm usually tends to thrombose, while the residual adventitia and surrounding tissues tend to organize into fibrous material. Consequently, all these tissues become calcified. Close examination of the CT scan [Figure 2]d shows extensive calcification of the false aneurysm wall facing the left hemithorax, rendering the aneurysm prone to rupture only in the cervical area. In this case, the patient has been extremely fortunate for a number of reasons. First, traumatic aortic injury is a lethal condition in the acute phase, so the patient belongs to the 2% that survives such an injury. Second, the rupture occurred while the patient was in a hospital environment where prompt resuscitation was possible. Third, a dedicated and experienced cardiothoracic team was on site which enabled accurate decision-making, a quick transfer to the operating room and a proper surgical approach. Last but not least, the false aneurysm ruptured to the patient's neck, instead of the left pleura, and this unique anatomic characteristic contained and tamponaded the bleeding, giving the necessary amount of time to the surgical team to assess the situation and operate. If the aneurysm had ruptured in the left pleural cavity instead, the outcome would have been fatal. Up to now, we are unsure of what prompted the late in-hospital rupture of the chronic pseudoaneurysm. We can hypothesize, however, that possibly a transient hypertensive episode due to the patient's anxiety for the imminent examination might have been the culprit. 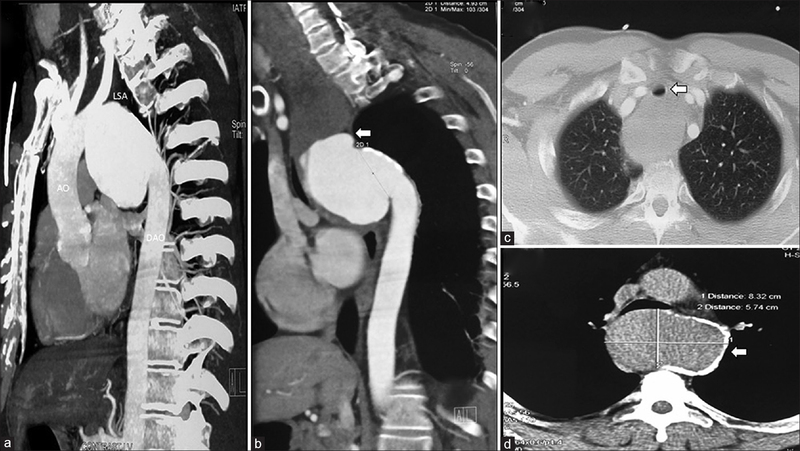 Cervical rupture of a chronic aortic aneurysm represents a very unusual manifestation with only a handful of these cases reported in literature. Similar cases have been reported in literature, but what makes this case unique is that it cites a rupture of an unsuspected chronic pseudoaneurysm in a rather unusual anatomic area, which proved essential for the patient's survival. Chronic posttraumatic pseudoaneurysms can be asymptomatic or present with symptoms such as pain, dysphagia, dyspnea, cough, and dysphonia which are attributed mainly due to large size. Although CT scan remains the first choice of examination, aortography supplements the assessment when an endovascular treatment is considered. The treatment for chronic traumatic aortic aneurysm involves either replacement of the diseased aorta with an interposition graft or endovascular stent grafting. Combined or hybrid approaches have also been proposed. The urgency of our case mandated an open thoracotomy approach while endovascular techniques are advocated on elective basis as meticulous preoperative planning is required. Moreover, the endovascular approach was excluded due to the patient's unique anatomic characteristics (no landing zone, sharp angle of distal arch). Chronic posttraumatic pseudoaneurysms of the thoracic aorta are uncommon clinical entities. We successfully performed a salvage operation in a patient who suffered a cervical rupture of an aortic isthmus aneurysm inside the hospital. The unique morphology of the aneurysm as well as the in-hospital occurrence of the rupture and the availability of the cardiothoracic staff contributed to the successful presented outcome. Chock MM, Aho J, Naik N, Clarke M, Heller S, Oderich GS, et al. 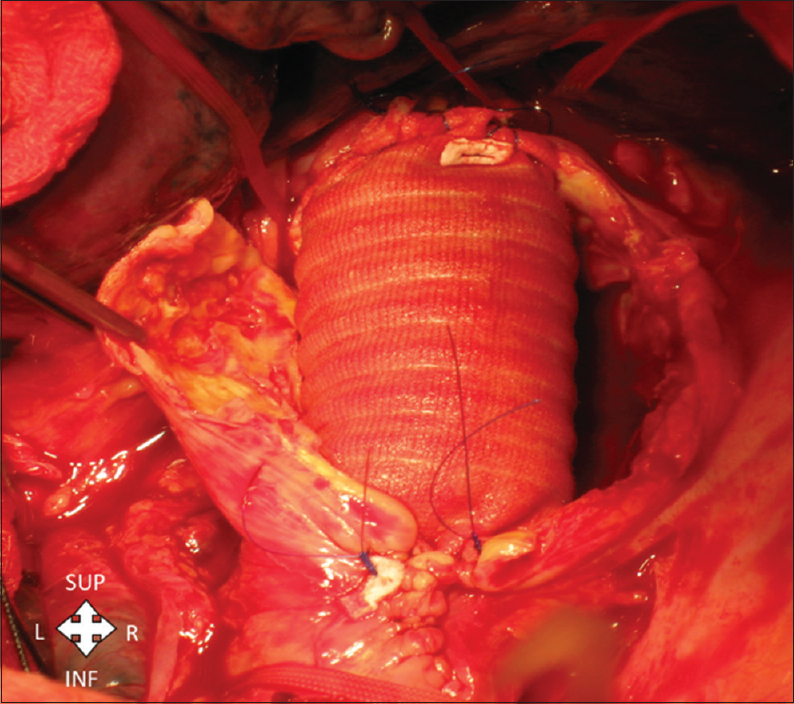 Endovascular treatment of distal thoracic aortic transection associated with severe thoracolumbar spinal fracture. Vascular 2015;23:550-2. Koenig GJ Jr., Efron DT. Thoracic trauma. In: Yuh DD, Vricella LA, Yang S, Doty JR, editors. Johns Hopkins Textbook of Cardiothoracic Surgery. 2nd ed. New York, USA: McGraw-Hill; 2014. p. 15. Parmley LF, Mattingly TW, Manion WC, Jahnke EJ Jr. Nonpenetrating traumatic injury of the aorta. Circulation 1958;17:1086-101. Nizet C, Van Damme H, Boesmans E, Lavigne JP, Creemers E, Defraigne JO. Chronic false aneurysm after a healed rupture of the aortic isthmus: TEVAR, hybrid surgery, or open arch repair? Ann Vasc Surg 2016;31:205.e11-6. Lindsay DC, Smith MC, McQuillan PJ, Jordan MB. Laryngeal compression and stridor as the presenting feature of ruptured thoracic aortic aneurysm. Report of two cases. J Cardiovasc Surg (Torino) 1989;30:864-6. Marcu CB, Nijveldt R, Van Rossum AC. Unsuspected chronic traumatic aortic pseudoaneurysm – What to do about it. Late post-traumatic aortic pseudoaneurysm. Can J Cardiol 2008;24:143-4. Pozek I, Hurt CJ, Stern EJ. Chronic posttraumatic pseudoaneurysm of the thoracic aorta. Curr Probl Diagn Radiol 2012;41:126-7.